Awesome job, FAU! Keep it coming. I keep pushing for University Commons to get a spirited makeover, simply by adding banners to the streetlights and repainting the landmark sign with our school colors, but no traction on that yet. Down the road I would have to think that University Village, the upcoming big project northeast of campus on Spanish River that we previously discussed here, would be a future target for FAU marketing. The goal has to be to blanket the area in signs and banners. If we could hit those four areas (as well as 20th Street, obviously) we’d be golden. And that’s of course for the university itself. 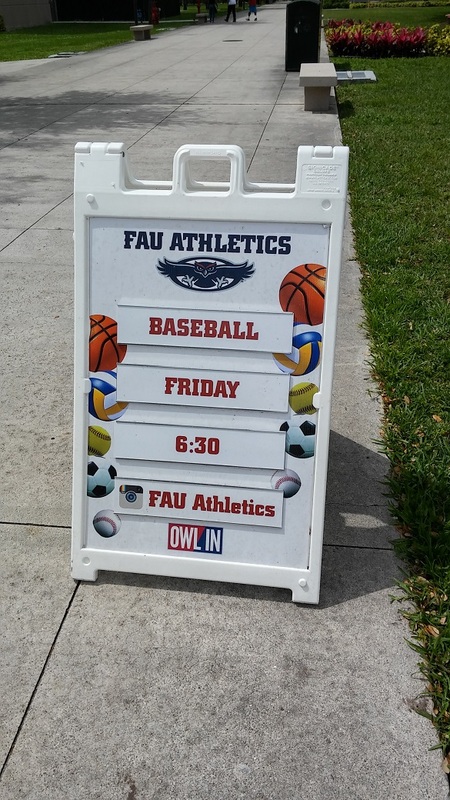 When it comes to sports teams, FAU always gets knocked on the forum for under-marketing the sports programs on campus but they’re certainly moving in the right direction with these sandwich signs on Diversity Way and in the Breezeway. Speaking of marketing, Coca-Cola recently visited campus to promote their products (even though it’s the only soda you can get on campus). I believe they were doing samples, playing music, and letting you record video of yourself in that clamshell tent. Nice to see them contributing to campus life like that. As I understand it, the school negotiates contracts with Pepsi and Coca-Cola once every decade to try and have them outbid each other to be the exclusive provider of soft drinks on-campus. We previously had Pepsi who, among other things, provided special Pepsi vending machines with mural pictures of FAU sports on it as well as providing their products for sports contests (you may remember hearing something along the lines of “you’ve won a year’s supply of Pepsi products!” at basketball games). The vending machines in particular were awesome because it promoted school spirit on the campus. We can always use more of that. After visiting Gainesville for the FAU/UF football game in 2007 I had contacted then-Athletics Director Craig Angelos about the possibility of renegotiating the contract the next time it came up to have the special FAU vending machines extend off-campus to places like the Publix in the Fifth Avenue Shoppes because the company had done the same for UF. I was unsure about how large a role he played in the discussion but I assumed he was at least at the table since it impacted the athletics department. 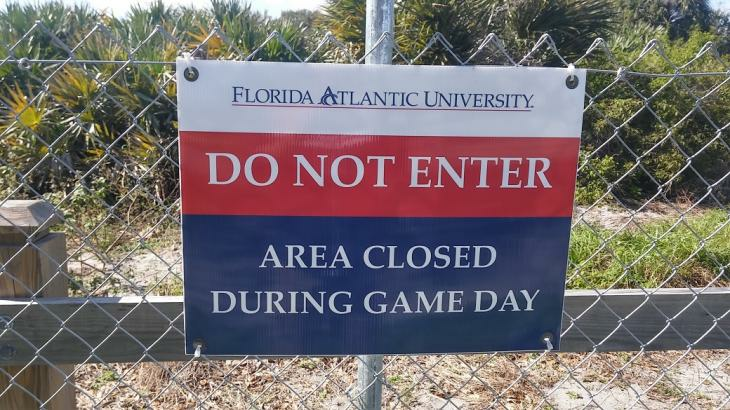 After all, why wouldn't FAU want their presence felt off-campus if they could get it? Pepsi or Coca-Cola… one of them would offer it. Fast forward to 2012 when Angelos was replaced by now-AD Pat Chun (who probably never heard my suggestion) and on March 10th, 2014 FAU announced that they had entered into a new 10-year partnership with Coca-Cola that offered, among other things, student internship opportunities. The agreement would also add the brilliant Freestyle machines to campus – if you’re not familiar, they are soda fountains with an iPad-type touch display where you can mix flavorings like cherry and vanilla into your Coke products. So definite upside there, and while we got vending machines in the Breezeway that accept credit cards, the machines on and off campus still look like regular Coca-Cola machines. A shame. Hopefully we can do better in 2024. …which also extend from the Breezeway to the Spaceship (SO building), and around the various concentric circle sidewalks outlining the Spaceship. It's a great start and I hope they build on it. This may or may not be tied to the Breezeway renovation. 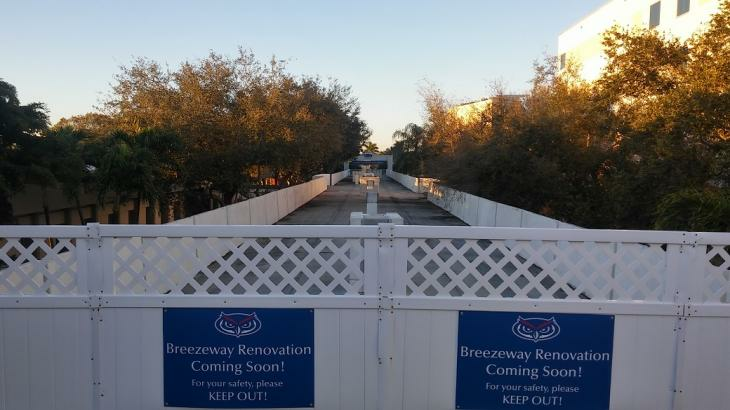 You may remember that on April 15th, 2014 FAU held a charrette on campus to drum up ideas for the future of the Breezeway. 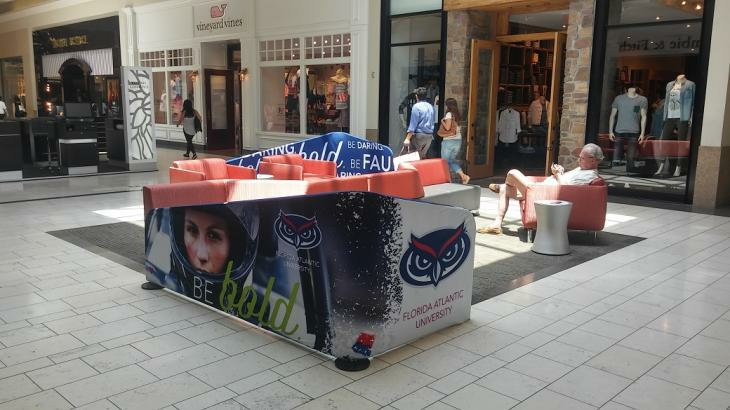 FAU has a little bit of money to burn on it and people threw out some really great ideas, from adding more school spirit to fixing the bathrooms to preventing skateboarders and bikers from mowing down walking students. Coach Partridge had a great idea to "tell the story of FAU as you walk down the Breezeway", pointing out that it would help him recruit. Now the renovation has gone through some hiccups but is in progress. 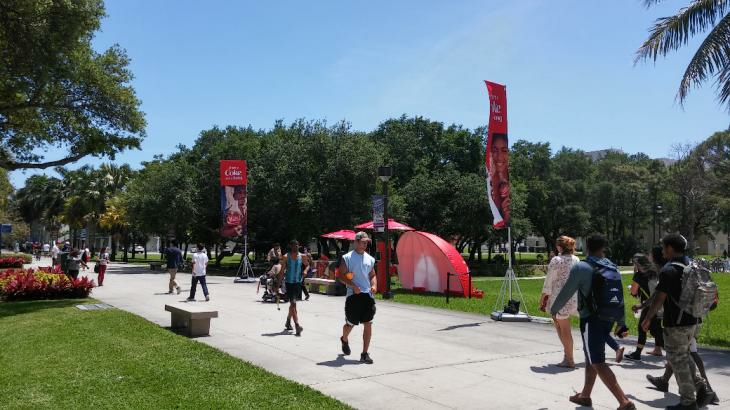 As previously pointed out, FAU painted the Breezeway alternating red, blue and gray (students still think FAU’s third color is white for some reason, but it’s gray) and put up metal Owl head logos every 3(?) pylons to bolster school spirit. It looks better than you'd think. At the charrette I talked to the landscape architect who would be putting in the plants and suggested how the Breezeway, especially the south side, would be markedly improved by both layering the plants and providing bright, contrasting colors. I have no idea if they listened, or cared, but I was happy to see this development regardless. After all, a recent study showed that people prefer more complex environments with different shapes, colors and plants, and this certainly helps in that regard. That's the first floor and the surrounding areas. What about up top? During the charrette the contributors mentioned improving the 2nd floor since many people don’t frequent the space. What could be done to draw students up there - avoiding traffic down below? Food? Tanning chairs? Gardens? What could be coming there? Students suggested adding a restaurant like Chic-fil-A (which we ultimately got by the library, displacing the Einstein Bros Bagels), but I can't imagine them doing that for a lot of reasons… space, weight concerns on the infrastructure, visibility/foot traffic… doesn't make sense. Closer to the south end between the health offices and the Ritter Art Gallery the original architect wanted to take out sections of the second floor to “open it up to the space below” and encourage interactions between the two levels, as well as add a staircase from the 2nd floor down near the existing Alumni Plaza area. I'm not convinced taking out sections would do anything, although I do like the staircase idea. In fact, if you wanted to do a little to-go restaurant site then putting it under a massive stairwell like that might make sense depending on the needs of the restaurant and the size of the stairwell. But really I imagined the renovation more like the Highline in NYC, creating a “raised park” with different zones based upon plant choice, overhead coverings, benches, etc, with bocce court at the north end. 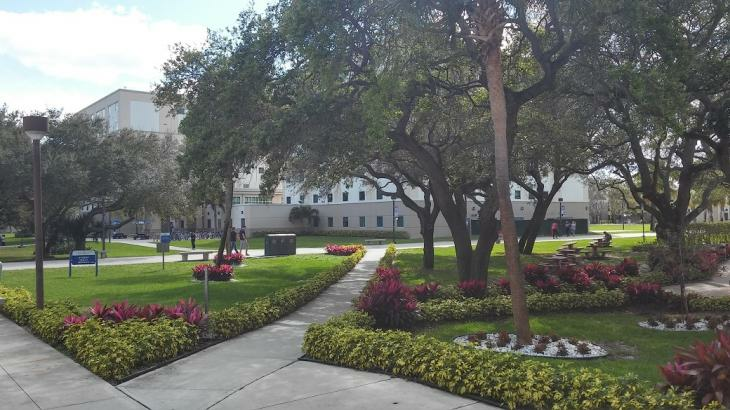 I thought this would be particularly good if the university “grows up around the space” in the sense of needing to erect more buildings and losing some of that green space between the Breezeway/Sanson/GS and the Admin/Spaceship buildings with the banyan trees. They may never do that because there is still a lot of space on the periphery of campus inside the "loop" created by the various North/East/west University roads, but it was a thought. At least that way you preserve some green space on campus which can’t be built on otherwise. Anyway, I’ll keep an eye on the space and update you as we progress; according to Facilities the project is “over budget and behind schedule” with a potential end date of 12/2016. 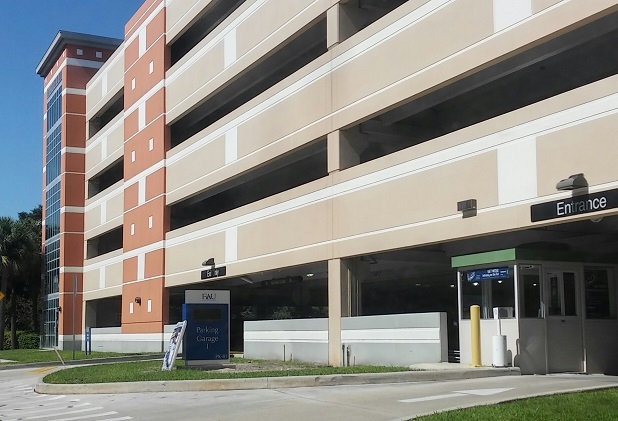 One place we’re progressing is in parking as Parking Garage 1 (by the library) has now gotten one of the LED parking counter signs letting all comers know how many spaces are left, ala PG3 near the stadium. These are nice too because they also update Twitter with how many spots are left so you can gauge the parking situation before you even leave the house or as you’re pulling onto campus. I don’t believe Parking Garage 2 (over by Arts & Letters) has this feature yet but hey, 2 out of 3 ain’t bad. Let’s move north now to the stadium. Still no shovels in the dirt for the Athletic Center although we seem to be getting closer and closer to that reality with the most recent donations. What has been done is a reaction to moving the Rat’s Mouth from the south side of the stadium to the north side parking lot, as students – particularly during the Miami game last year – were tailgating there in massive tents and then hopping the fence into the Preserve to urinate, vomit, or in some cases (unfortunately) just toss aside their empty beer cans and trash. Predictably, this went over like a pile of bricks as FAU groups wanting to protect the Preserve became outraged and the university responded by putting up a fence along the entire area facing the parking lot. Back to the party fouls. This litter unfortunately fed into the idea that Greek Housing, which is projected for the same area, would continue to do damage to the Preserve and ultimately jeopardize it as a potential Greek Housing site. If that’s the case it would delay the process even moreso as a new site is chosen, though Student Government seems to think it’s the best place for the Housing and they’re not the only ones. Haven’t heard anything new about Greek Housing lately although personally I think FAU could kickstart the process by building a $3-5M multi-use Greek Life Center with offices, ballrooms, library, study rooms, maybe a pool, etc in order to attract further interest; the houses could then be built around it and the Center could then become an entry point for students who wanted to know more about Greek Life outside of Rush, as a museum, to expand upon event space, and of course for gatherings of the Councils. Last but definitely not least, FAU’s military student population seems to be “on the rise” (to use sports recruitspeak) and I’ve heard talk of creating an Office of Military and Veterans in the Student Union. There was also this competition to design a veteran’s memorial monument on campus through the combined forces of Student Affairs and SG; the article mentions the monument would be “no more than $250,000” and “completed in 2017” but no particular location has been chosen yet. Depending on the size of it, there are several good locations. For instance if you’re doing a D.C.-style Vietnam War wall of names then you might want to choose a place like the (admittedly underused) sidewalk from Diversity Way to the library parallel to the Student Union. If you’re doing more of a statue then perhaps Heritage Park (the actual forest area) is a better fit; in fact there are ringed sidewalk areas surrounding plants that could surround a statue there. And so on. In any case, this is a fantastic idea and I look forward to seeing it. - Athletic Center: Hiring an architect. - Medical school office building: nearly complete and looking great. - “Fifth Avenue Student Housing” project (formerly The Grove) at 2600 NW 5th Ave: in review with The City. No groundbreaking yet. Did some digging a little while back and I believe thisis the company that purchased the site but I haven’t seen anything lately. - Renaming 20th Street: no news. SG hasn’t announced the winner of their #Rename20th contest. - Schnellenberger’s restaurant: haven’t seen any new construction. Believe it’s still going through paperwork/permitting. New feature here since everybody likes talking about food. The Boca area has seen some student-friendly developments in the past few years such as Shake Shack in University Commons and Chipotle, Starbucks, Brooklyn Water Bagels and Blaze Pizza on Federal Highway. Recently opened are www.tuckerdukes.com (craft burgers) which replaced Italio near Chipotle, and Fresh Kitchen near Brooklyn Water Bagels on Federal Highway. Still waiting on Mellow Mushroom AND Lime/Tijuana Flats to open across from campus in University Commons. Maybe 100 Montaditos, which has $1 menu items on Wednesdays… Just sayin’! Oh, and hats off to The Hoot, the FAU-centric satire site ala The Onion, on their success so far including this recent New Times article. Always thought it'd be funny to do this for FAU! Another great blog entry. With the rats mouth, everyone agrees with it was a bad move to shift it to the north lot. I wonder if the student government will revisit this at the start of the new school year. Question for you, is there any plans to renovate any of the buildings on campus in the future? Hahaha I actually included a paragraph about that very thing initially but didn't want to keep saying, "I know this is out there but haven't heard anything new about it." That's all I can think of off the top of my head from the document yesterday. I feel like General Classrrom South has to be on there too because they've been talking about expanding it east for awhile now, but I'm not 100% on that at the moment.